There are so many social networks to connect with family, friends and followers. Each social network is slightly different than the other. Social networks are more entertaining and useful when you access them from your smart phone. Privacy is the biggest concern when we post our updates on Facebook, Twitter, Google Plus or any other social networks. We need a social network which focuses more on privacy. For those people who want to connect with their close friends and family members, there is a smart android application called Path. 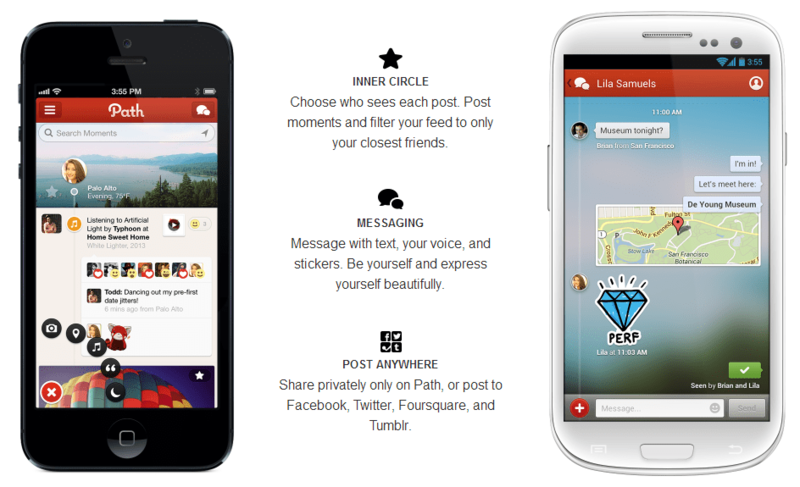 Path is a ad free private social network for people using their smart phone. I like Path because of its timeline view. You can see all your posts on a vertical timeline. This vertical timeline is the Path of your life captured and recorded in moments. You can follow your path together with close ones. It is possible to find and add friends to share your Path. But there would be some moments that you would like to keep private, so Path allows you to post private moments. No will see these private updates except you. You can also share specific moment with specific friends. Your friends can comment on your posts with smiley. You also get to know who have seen your posts. There is one interesting feature of Path. Path made it easy to record your sleeping and awake times. There are five different types of moments that you can post to your timeline, Photo, Place (Checkouts), Music (Movies), Text (Blog, Diary), Bed Time. It is possible to simultaneously share your moments on any or all of these main stream social networks, like Facebook, Twitter, Tumblr, Foursquare and WordPress. You have to connect your social accounts with Path from its settings. You can search through your moments considering the holidays, seasons, weather, location and the type of moment. Path – a social network application also made it easy to send instant messages to your friends. You can also use this application as a smart phone messenger. You can send photos, maps, music, audio and text. This is a free social network, but Path do not show advertisements. Though there is the option to upgrade. Once you upgrade, you get unlimited sticker packs, unlimited camera filters, early access to new shop items and this also makes you the supporter of ad free social network. If you would like to try private social network “Path”, you can install this application from Google Play and App Store (Apple). Next Post Why AdBlock Should Change? Guidelines!